All you need to do is check the booze publications, and you’ll see the revival of American malt whiskey widely touted as the “next big thing.” Driving the malt whiskey momentum is that the spirit, as a category, was and still is largely ignored by big distillers, leaving an open field for the crafty little guys to stake a claim. Many have, and their efforts are now starting to achieve critical mass. Those who love bourbon, but are averse to scotch, should note that American malts can offer quite a contrast to Scottish and even Irish whiskies, due to differences in law and tradition. Scottish and Irish single malts are made from 100% malted barley in copper pot stills, and most often aged in used casks, usually former bourbon, sherry or port casks. American malts need only have 51% or more malted barley in their mash bill. It’s certainly possible under federal law to make a 100% malt whiskey, but many use other grains and thereby bring in other flavors. Likewise, there is no requirement in the U.S. for malt whiskeys to be made using copper pot stills, and the use of a column still combined with the variable grain recipe could produce a new make spirit closer to what the Scots and Irish call a grain whiskey than malt whiskey. Finally, and perhaps most important, American malts are aged, at least in part, in charred, new oak barrels. 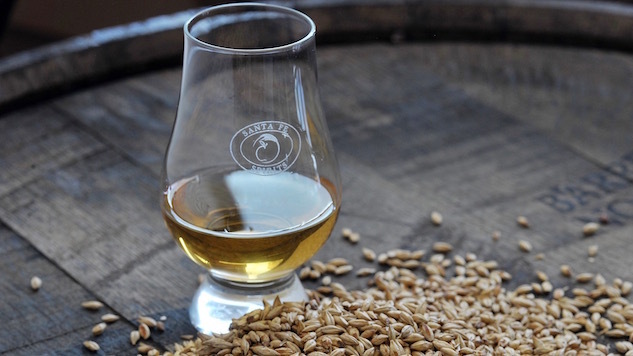 One last distinction is the term “single malt.” As applied to an American malt, it means the same thing as it would for one of its Scottish relatives: all the whiskey comes from a single distillery and it was made from a 100% malted barley mash bill. These five American whiskeys, all not just American malts but single malts as well, are the best examples of what is out there today. Balcones is one of the best established small distilleries in the country, and their Texas Single Malt is their flagship. Starting with the use of a high-quality barley variety (abandoned for the thrifty Scots for the most part, due to cost) and slow fermentation, the whisky then relies on multiple rounds of blending and barreling. That is a labor-intensive process, but one that allows the distillery to infuse plenty of flavor. Made by Santa Fe Spirits in New Mexico, this single malt has two interesting facets that make it stand out. First, some of the malt used to make the whiskey was smoked with mesquite, a particularly Southwestern answer to Scotland’s peat. Second, it was aged in the high desert climate of New Mexico. The use of mesquite smoking is not unique to Santa Fe Spirits, but Colkegan is one of the best examples of it to come out thus far. Operating out of both Kentucky and Tennessee, Corsair has a well-earned reputation for wide-ranging experimentation in the smoking department. Triple Smoke is both their principal product and a sound example of all the trial and error that goes on behind the scenes at the distillery. The whiskey is made with three separate smoked malts, done with the classical peat plus cherry and beech wood. The three are brought together and aged in small, new oak barrels. When it was published in 2012, 1001 Whiskies You Must Taste Before You Die described St. George’s as an item that “might just be the best U.S. single malt available today.” A lot has changed these last four years, but St. George’s, now in its 16th batch, is still able to mount a strong argument for being the best single malt in America. St. George’s is one of the oldest micro-distilleries in the country, dating back some three decades and well, well before the craft distilling boom. As a result, they occupy the rare position of have stocks of malt whiskey up to a decade and a half old to use in blending their single malt releases. This Seattle-based distillery probably comes the closest to its counterparts in Scotland. They use 100% malted barley, rely on copper pot stills and do their business in a climate not too dissimilar from Scotland’s. Yet there are those distinctive twists that mark the American approach, such as Westland’s use of a handful of specialty malts more often found in beer-making, and not just the one malt variety. All of this malt business is on top of the signature American trait of using new oak barrels. In addition to their flagship American Single Malt, Westland also makes peated and sherry wood versions, and recently released a winter seasonal.